Saigon - Kim Lien Hotel, formally known as Kim Lien Hotel, was completed on 19/05/1990 in celebration of 100 years of birth of President Ho Chi Minh (19/05/1890 – 19/05/1009), locating on his motherland. This place was also the venue of the international conference “President Ho Chi Minh – a national liberation hero, an international cultural celebrity” with the attendance of over 40 countries all over the world. Many other important events were also taken place on his 100th birthday at this place. Coming to Nghe An - Ho Chi Minh’s hometown, you are always welcome in Sai Gon – Kim Lien hotel whether you are a Vietnamese or a foreigner. This is also a chance to show your respect to Uncle Ho. 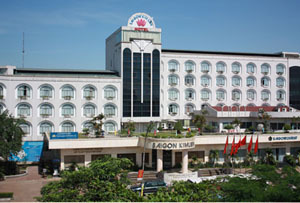 Sai Gon – Kim Lien Hotel, a 4-star classified hotel, is located in the center of Vinh City, Nghe An Province. With 80 well-equipped bedrooms and VIP rooms; 3 restaurants, 02 multi-function ballrooms, bar and garden and many other relaxing, comfortable and luxurious entertainment service, we surely will please your accommodation with us. During your stay in Sai Gon Kim Lien Hotel, you will not only enjoy the warmly, luxurious space, the thoughtful and whole-hearted service, but also several of occidental and oriental food as well as local dishes. Especially, SGKL is an ideal place for wedding ceremonies combing between modern and traditional style, where all couples will find perfect moments in the happiest day of their life.